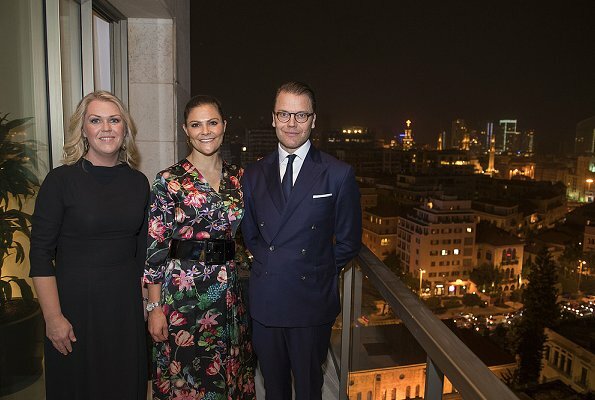 On the second day of their visit to Lebanon, Crown Princess Victoria and Prince Daniel met with presidents of UNHCR, UNDP, Unicef and UNRWA and attended many events including meetings with various UN agencies. At the end of the day, they attended a reception in Beirut at the residence of Jörgen Lindskogs, Swedish Ambassador in Lebanon. After a duration of 17 years, Sweden opened an embassy in Lebanon. At the reception, Crown Princess Victoria wore a BY MALINA Columbine Dress. Oooh! another floral dress... If I don't criticize, I have nothing positive to say. Then do not post! Negative critic is not a positive. Too busy to my taste. Will be so glad when these floral dresses are gone. I'll be glad when the low-riding jeans, etc, are gone; but that's been the trend since 2001 or so. Away with muffin tops and back to the natural feminine waist! Many quite nice dresses on Malina's website; this one is the one I like the least, sorry. It looks good on her. Nice upper part too many flowers for a dress,maybe it should have been paired with a solid color skirt. On the Model this dress looks like a robe. Love the dress, the couple, the view! I do admit I like this kind of dress, especially on Victoria! Not a fan of floral but this is one of the better outfits we've seen Victoria wear this tour. She looks very good and absolutley approbiate for the ocasion. We are uesed to critizise her and for the bun, which is a no to fashion and the floral patterns which have the touch of being inmature. She looks very good and absolutley appropriate for the ocasion. We are used to criticize her for the bun, which is "no" to fashion and for the floral patterns which have the touch of beeing inmature. I'll take on the belt, since it hasn't been mentioned. It is too wide. It looks like a wrap dress, so the belt should not have been necessary. Both of them, the Crown Princess and Prince Daniel are superb representatives of Sweden.